Aspen is a world famous, for good reason. This is a beautiful ski town, with skiing on four separate ski resorts, Aspen (Ajax), Snowmass, Aspen Highlands, and Buttermilk. 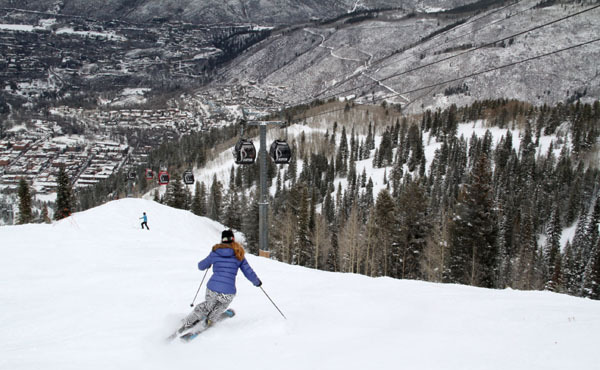 Recently Aspen the company has formed Alterra, and acquired Intrawest ski resorts Steamboat, Copper, Stratton and Tremblant, plus Deer Valley, Mammoth and Squaw Valley/Alpine Meadows – so Aspen skiing is expanding. All these amazing resorts are part of the IKON Pass, Alterra’s answer to Vail’s Epic Pass. The classic ski town of Aspen lies in the heart of all this great Rocky Mountain skiing. Aspen is as famous for its après ski and chic shopping as for its skiing. Downtown Aspen is so western pretty, with a brick lined pedestrian mall looking up at the ski trails, and luxury Aspen hotels, swank restaurants, bars, and shopping along every street. You can walk from most Aspen lodging properties, like the Limelight Hotel and Little Nell, to ski Ajax- local speak, or take a shuttle to Aspen’s other mountains. For an ideal Aspen family ski trip, stay in Aspen for a few days, then go to Snowmass Village for a few – a perfect alpine plan. Snowmass Village in Aspen has more ski resort feel, with slopeside lodging at Viceroy or the Limelight, and great kids’ ski and snowboard program based out of a cool Tree House Lodge. But for great après ski and local flavor, downtown Aspen is the place to be – with some of the best apres ski anywhere! Aspen Mountain (Ajax) is Aspen’s original ski mountain, since 1946, emanating from Aspen village with a convenient Silver Queen gondola that lifts skiers up the full 3,267′ vertical to great ski runs with perfect views of Aspen’s streets below. Classic Aspen ski trails like Copper and Silver Bell are typically well groomed in the morning, funneling down to Kleenex Corner and Little Nell to town. Edgier glades on Gent’s Ridge and the Face of Bell offer skier more natural un-groomed and challenging skiing. Ruthie’s Run is a World Cup race venue, with a birds eye view of downtown while you are downhilling. Families will love staying in Aspen, everything is walk-able. The Limelight is a cool hotel in the heart of the ski town, owned by Aspen, with a casual family and dog friendly vibe, and a great outdoor pool with hot tubs, a beautiful lobby lounge with après ski entertainment and wood fired pizzas, plus a ski valet with ski storage. You can walk to town, to thepark right next door, the pedestrian mall, Aspen’s chic shops, and casual eateries like the Red Onion and Ajax Tavern, and of course – the Aspen gondola and ski slopes.